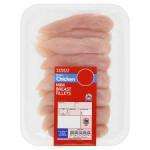 Not bad on some of it but most supermarkets do 3 for £10 and the quality of Tesco meat is in general pretty poor. Note also that tesco have also reduced the pack size of most of these so no real reduction in price, especially as you now need to buy £12 to get the multi-buy offer. Note also that tesco have also reduced the pack size of most of these so … Note also that tesco have also reduced the pack size of most of these so no real reduction in price, especially as you now need to buy £12 to get the multi-buy offer. Don't you have a freezer? Isn't yours already full, with better offers, as mine is?